Greenleaf Book Group Press, 9781626341975, 248pp. Would you like more control over your life and your work? Would you like greater stamina as you carry out your daily tasks? How about more significance and meaning as you move forward in your career? Scott Halford shows us how we can all find these things if we simply understand how to activate the full potential of the brain. This incredible organ is still full of mystery, but we know enough to harness its power better than ever before. We just have to recognize how the brain works, and understand the actions we can take to help it perform at its best. Combining research, anecdote, and inspiration, Activate Your Brain shows you how small steps toward better brain function and management can eventually lead to success on a whole new level. 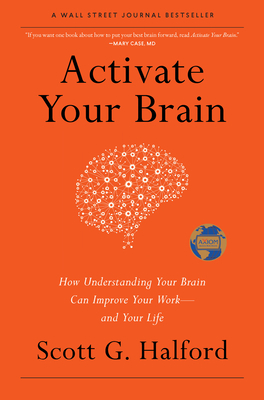 Each chapter offers "Activations"--exercises that help optimize your brain function to . . . In the end, Activate Your Brain is an indispensable collection of practical things you need to know about your wonderful brain--which, when fully harnessed, can give you more of the fulfilled life you seek. SCOTT HALFORD, CSP, CPAE, is an Emmy Award-winning writer and producer, an engaging presenter, and a long-time consultant to Fortune 500 executive teams. His expertise and experience enrich the contribution that he makes to every client. Scott's expansive knowledge in the areas of achievement psychology, which includes brain-based behavioral science, emotional intelligence, critical thinking, and influence, add richness and depth to his programs. Scott's insight into the human experience at many levels, and in many different situations, allows him to communicate in workshops and keynotes with humor, wit, and depth. He is a captivating storyteller who is able to transport his audiences to destinations they may have never been physically, mentally, or emotionally. Participants laugh and learn, and consistently praise the rich and rewarding experience that positively affects their success. Scott was inducted into the National Speakers Hall of Fame in 2014 (CPAE). He is a Certified Speaking Professional (CSP), the highest earned designation of the National Speakers Association and the Global Speakers Federation. He is also an accredited and certified Emotional Intelligence Provider as well as a Certified Associate in Emergenetics, the study of performance and preferences based on genes and the environment. Scott has an executive master's in Neuroleadership. Scott is cofounder and Principal of Complete Intelligence, LLC. Corporate clients span many industries and include GE, Bank of America, the Walt Disney Company, Microsoft, First Data, Medtronic, Johns Hopkins Hospital, Centura Hospitals, MillerCoors, Ingersoll-Rand, Western Union, and many more.